DConf 2013 was a huge success! I’ve finally recovered enough from my red-eye flight back to the East Coast to blog about a topic that really stuck out in my mind from it. At DConf, I gave a talk on D-specific design patterns. (The video will be up on dconf.org shortly.) One pattern in particular attracted much more audience attention than I thought it would, so I decided to blog about it: The Low-Lock Singleton Pattern. Most of these people also probably know that this naive implementation is a concurrency nightmare. You can’t safely call get() from multiple threads simultaneously. The most obvious reason is because two instances of MySingleton will get created if get() is called from a second thread before it’s finished running in the first thread that called it, i.e. before instance_ !is null from the first call. Now, if Thread 1 calls get(), it has a chance to finish instantiating instance_ and storing a reference to it before Thread 2 checks whether instance_ is null. There’s only one problem with this: It comes at a huge performance cost (benchmarks forthcoming). Entering a synchronized block is expensive. Intuitively this seems reasonable. instance_ can’t go from non-null to null, only from null to non-null. Therefore, if it’s already non-null by the time we get to the first check (the one outside the synchronized block) it would seem we know every thing we need to know and can simply return instance_. Alas, the real world is not that simple. The details are complicated and best explained by others, but the executive summary is this: The sequentiality of program execution is an illusion maintained within a single thread. Compilers and CPUs reorder instructions and the illusion breaks down when dealing with multiple threads. For example, instance_ can be assigned a non-null value before the object it refers to is fully constructed. The idea is simple: We maintain a thread-local flag to track whether we’ve already entered the synchronized block from the current thread and ensured that instance_ is instantiated. The synchronized block is entered once per thread, amortized over a whole run of the program. On GDC the overhead of TLS vs. unsafe is virtually undetectable. On DMD it’s noticeable but small. In both cases it pales in comparison to the overhead of synchronizing on every call to get(). Note that this benchmark was run in a single thread, so the mutex used to implement the synchronized statement was never contested. 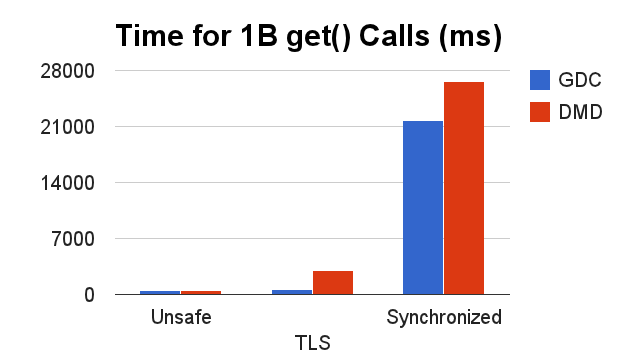 If it were, the results when synchronizing on every call to get() would be far worse. There you have it: An obscure Java pattern that was ahead of its time, resurrected in the presence of more modern thread-local storage implementations in D, lets us have our cake and eat it too: Fast Singletons that are thread safe without any dependence on obscure memory model details. Thanks for the interesting article, but I find the usage of the word “invention” bit too much – I mean, you just straightforwardly need/use a `thing` with an atomic read – and the language (D in this case) provides it out of the box. Not a D programmer but doesn’t this work? It should create a new instance once and only on the first time the class is referenced. Which only gets initialized once, in a thread safe way, the first time the class is accessed. Maybe it’s because D is unmanaged and there’s no thread-safe static constructor stub that blocks others from accessing it. Sam Pullara’s method won’t work in D, as the static variable will still be in TLS. And MIchael’s attempt wouldn’t work because, 1. As the constructor is private, it can only be accessed from inside the class/instance itself, and therefore never gets called, and 2. The constructor calls itself, which is disallowed in D. You can chain constructor calls, to reuse code, but you can’t have a cyclical call (A calls B, which calls A again) within class constructors.